The blue-naped pitta (Hydrornis nipalensis) belongs to the family of pittas, Pittidae. The blue-naped pitta species are distributed in India, Nepal, Bhutan, Bangladesh, southern China, Myanmar, Laos and Vietnam. These pitta species are brightly colored having bright blue nape and hinderneck. These pittas are polytypic species. The blue-naped pitta (Hydrornis nipalensis) is a distinctive colourful bird, measuring 20 to 25 cm in length and weighing 110 to 130 grams. The blue-naped pitta male has uniform olive-green upperparts. The crown, nape and hinderneck are bluish. In female the hindercrown is reddish yellow and the hinderneck is greenish. The forehead and the sides of the head are rufous. The chin and upper throat are whitish, merging gradually into fulvous underparts. The stubby tail is brown with green tinge. There is a black thin postocular stripe. The bill is brown. The irises are brown. The feet are pinkish-brown. The juveniles are paler than the adults. The covert-spots are buffy. Crown has pale buff markings. The ear-coverts are buff. The call of these species is a sharp, double whistle "uk-wuip..uk-wuip" or "ip-wuiip..wuiip" sound. The blue-naped pitta species are distributed in northeast India, Nepal, Bhutan, Bangladesh, southern China (Yunnan, Guangxi), north and central Myanmar, northern Laos and northern Vietnam. In India, these blue-naped pitta species are distributed in the states of Sikkim, West Bengal, Assam, Meghalaya, Arunachal Pradesh, Nagaland, Manipur, Tripura and Mizoram. The blue-naped pitta nominate subspecies H. n. nipalensis is distributed in northeast India, Nepal, Bhutan, Bangladesh and northern Myanmar. The blue-naped pitta subspecies H. n. hendeei is distributed in eastern Myanmar, southern China (southern Yunnan, southwest Guangxi), north and central Laos and northern Vietnam. The Important Bird and Biodiversity Areas (IBA) of these blue-naped pitta species in Laos are Nam Et and Nam Xam. The IBA in Nepal is Phulchoki Mountain forests. These blue-naped pitta species have medium forest dependence. These species normally occur in altitudes from 0 to 1500 meters. The artificial ecosystems of these pitta species include heavily degraded tropical and subtropical forests and reclaimed forests. The natural ecosystems of these species include broadleaved evergreen forests, primary and secondary forests, tropical and subtropical moist lowland forests, tropical and subtropical moist montane forests, bamboo woodlands, tropical and subtropical swamps. The diet of the blue-naped pitta consists mainly of insects. Grasshoppers, crickets, beetles, snails, worms, moths, spiders, small frogs and lizards are their primary food. Occasionally they may feed on berries and plant matter. The blue-naped pitta are terrestrial, forage in clearings in early mornings and late evenings. The breeding season of these blue-naped pitta species is from April to August in Indian Subcontinent. The laying season is from April in Myanmar. These blue-naped pitta are monogamous and defend their breeding territory. The breeding pair build a large dome shaped nest with side entrance. The nest is hidden amongst vines or vegetation. The typical blue-naped pitta clutch contains 3-5 white eggs. Both the parents take turns to incubate the eggs for 14 to 16 days. Both the parents take part in raising the chicks. The nestlings are entirely altricial, being naked and blind require continuous parental care. The blue-naped pitta species are non-migratory resident birds. In Himalayas, altitudinal movements have been observed. The birds in higher altitudes move to lower levels during winter. Post breeding, the juvenile pittas may disperse and establish in new locations within the range. They may make local movements for feeding and breeding within their range. The global population size of the blue-naped pitta (Hydrornis nipalensis) has not been quantified. The overall population trend of these species is reported to be decreasing. Throughout its range this pitta species is reported to be very abundant to rare. The generation length is 4.2 years. Its distribution size is about 1,620,000 sq.km. Habitat degradation and fragmentation and trapping for the cagebird trade are the main threats that may endanger the survival of these pitta species. The blue-naped pitta (Hydrornis nipalensis) does not approach the thresholds for being Vulnerable, either under the range size criterion, or under the population trend criterion or under the population size criterion. The IUCN (International Union for Conservation of Nature) has categorized and evaluated the pitta species and has listed it as of "Least Concern". The CITES (Convention on International Trade in Endangered Species of Wild Fauna and Flora) status is ‘Not Evaluated’ for blue-naped pitta (Hydrornis nipalensis). The blue-naped pitta (Hydrornis nipalensis) is closely related to rusty-naped pitta (Hydrornis oatesi) and blue-rumped pitta (Hydrornis soror). 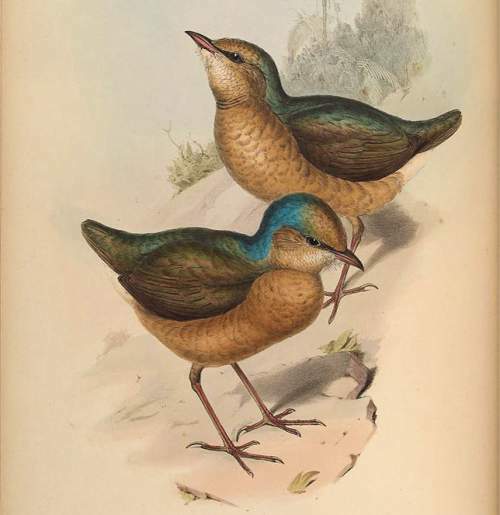 The two recognized subspecies of bluish naped pitta (Hydrornis nipalensis) are: Hydrornis nipalensis nipalensis (Hodgson, 1837) and Hydrornis nipalensis hendeei (Bangs & Van Tyne, 1931). Current topic in Birds of India: Blue-naped pitta - Hydrornis nipalensis.